John Neill Florence (known as Neill) was born at Gympie on 4 June 1895, the eldest child of John Geddie Florence and Annie née Neill. Intending to work on the Gympie goldfields, his father came to Australia from Morayshire, Scotland on the ship Merkara arriving at Brisbane on 17 June 1887. He met Annie Neill the daughter of John Neill, a mine manager in Gympie and they married there in 1893. John and Annie Florence kept a shop at Pound Hill in Gympie in the early 1900s and in 1906 moved to a farm at Mothar Mountain, 15 km to the south-east of Gympie. Their other children were James Geddie, William Bryce and Barbara. The family was active in the work of the Monkland Presbyterian Church and Sunday School. John Neill Florence was quite successful at school. While a pupil at Monkland State School, he received prizes for regular attendance and general proficiency. In 1910 he gained 95% in the upper middle division of the annual Presbyterian Assembly Examinations. His schooling continued at the Christian Brothers’ School in Gympie, Gympie High School and Nudgee College. He completed requirements for the senior certificate in 1914 obtaining passes in History of England, Geography, English, Arithmetic, Algebra and Geometry and qualifying him for matriculation to the Faculty of Arts at the University of Queensland. The year 1915 was spent as a pupil-teacher at Central Boys’ School, Bundaberg where he passed the examination with great credit. In 1916 while resident at Emmanuel College, then situated at Gregory Terrace, Spring Hill, Neill commenced studies towards a degree in Arts at the University of Queensland. In addition to his studies, Neill Florence served for three years in Senior Cadets and three years in Citizen Forces. He was a communicant member of Saint Andrew’s Presbyterian Church in Creek Street, Brisbane. At the age of 21 years and 3 months, John Neill Florence enlisted to serve overseas in the Australian Imperial Force on 30 September 1916. He was appointed to reinforcements for the 25th Battalion with regimental number 6664 and began training at Enoggera Camp. Next-of-kin was his mother, Mrs Annie Florence of Woondum, North Coast Line and his religious denomination Presbyterian. His unit embarked from Sydney on board HMAT1 Wiltshire, on 7 February 1917 and arrived at Devonport, England on 11 April. During training at Rollestone in southern England, J. N. Florence held the rank of acting lance corporal. He reverted to private when he joined the 25th Battalion in France on 6 November 1917. The 25th was not involved in major battles at this time, having taken part in the 2nd Division’s first wave at the battle of Menin Road in Belgium and the capture of Broodseinde Ridge in October. Unfortunately Private Florence became ill in France in early January 1918. He was taken to the 55th General Hospital in Boulogne before being admitted to the General Military Hospital Edmonton in England on 21 January suffering from pleurisy and pneumonia. After discharge from hospital he was granted furlough in England before joining the 5th Training Battalion at Fovant in preparation for return to the Front at the end of July 1918. The year had been an exhausting one for the 25th Battalion. It participated in battles at Morlancourt, Hamel, Amiens and along the Somme Valley as the German Army retreated. On 3 October 1918, the battalion took part in a successful attack to break through the German defences around Beaurevoir. Its strength however had been sapped and the 25th Battalion was disbanded nine days later. The remaining troops, Private J. N. Florence among them, joined the 26th Battalion. Though the Armistice was signed on 11 November, Private Florence did not leave France till 1 February 1919. A period of repatriation followed and Private Florence returned to Australia on HMAT Port Denison. He was discharged from the AIF on 18 June 1919. On his return to Brisbane John Neill Florence completed requirements for his Bachelor of Arts degree which was awarded to him in 1922 and continued his teaching career in the Queensland Department of Public Instruction. After temporary placement in Brisbane he received a transfer to the staff of Townsville State High School. There he met another teacher on staff, Esme Caroline Beatrice Alice Reid (1902 – 1978). Esme had been a student of Warwick State High School where Mr R. C. Hamilton2 was Principal. Miss Esme Reid had gained the degree of Bachelor of Science at the University of Queensland. She was an accomplished singer and violinist who had become well known in the Townsville Women’s Club for her musical contributions at their social functions. Rev J. A. Hunter officiated at the marriage of Neill Florence and Esme Reid in Saint Andrew’s Presbyterian Church, Rockhampton on 12 January 1928. They returned to teach at Townsville High while living in Mitchell Street, North Ward till their transfer to Goondiwindi where Neill took up his first appointment as Head Teacher at Goondiwindi East State School in 1931. Their next move was to Rathdowney for twelve months. He was praised for his sterling qualities as teacher and citizen at a special farewell in the Rathdowney Hotel when he was presented with a gold mounted fountain pen suitably inscribed. A three-year term at Augathella State School followed. Again, the school committee expressed appreciation for the assistance Mr Florence had given. Again he was presented with a gold mounted fountain pen. Mr and Mrs Florence received an envelope containing bank notes from the parents, guardians and friends of Augathella. The tennis club gave a bridge set in a leather case to Mrs Florence and a thermos flask to Mr Florence. At Lakes Creek State School from 1936 until 1951, the Florence family gave notable service to the community. Neill Florence recognised the importance of sound parent-teacher relationships and built close ties between his teaching staff and parent groups. At a public function at the school in 1950, the Regional Director of Education, Mr A. B. Copeman praised Mr Florence’s leadership in this area saying the cooperation and fellowship between teachers and parents was a good basis on which to make progress. During the Second World War when Rockhampton was an important strategic base in the Pacific campaigns, the organisation of Air Raid Precautions involving many households and volunteer A.R.P. wardens was vital. Neill Florence used his World War 1 experience to advantage and served as Divisional Warden in the Lakes Creek police district. When the activities of the Lakes Creek Division of the Air Raid Wardens’ Organisation of Queensland were being finalised in June 1945, Mr J. N. Florence was presented with a chandelier by the wardens who were grateful for Mr Florence’s administrative capabilities. Another aspect of the Florence family’s time at Lakes Creek State School was their involvement in the Lakes Creek Baptist Church. Mr J. N. Florence was a popular tea-table speaker at its anniversary celebrations. At such functions, Mrs Esme Florence conducted the Sunday School choir and played a violin solo. The Koongal-Lakes Creek Citizens’ Association in which Neill Florence was treasurer formed a highly effective lobby group for improvements in the local streets and recreational areas. Neill Florence gained a further educational qualification during his Lakes Creek appointment. As an external student of the University of Queensland he was awarded the Certificate in Education (A. Ed.) in 1946. Mr J. N. Florence was transferred as Head Teacher to Baralaba State School in 1951. Again he and Mrs Esme Florence rendered voluntary service to the community. Neill chaired the committee organising the annual commemoration of Anzac Day and gave the Anzac Day address. Mrs Florence organised the children’s choir and performed violin solo items. School funds were raised successfully through the planting and harvesting of cotton. With failing health, Neill Florence was content to accept an appointment as a correspondence school teacher during the remaining years of his distinguished career. He and Esme lived at Tarragindi and Mrs Esme Florence B.Sc. also accepted a teaching position at St Margaret’s Anglican Girls’ School and later at Salisbury State High School. John Neill Florence is remembered on honour boards at Gympie State High School and the University of Queensland. Unfortunately his Christian name is incorrectly spelt on the honour board in the Merrington Anzac Memorial Peace Chapel at Saint Andrew’s. He died in Brisbane on 12 February 1964 at the age of 68 years, leaving his widow Mrs Esme Florence, their sons John, Ross, Neill and Ian and one daughter Dawn. He gave unselfishly and left his mark of devotion to duty wherever he served. 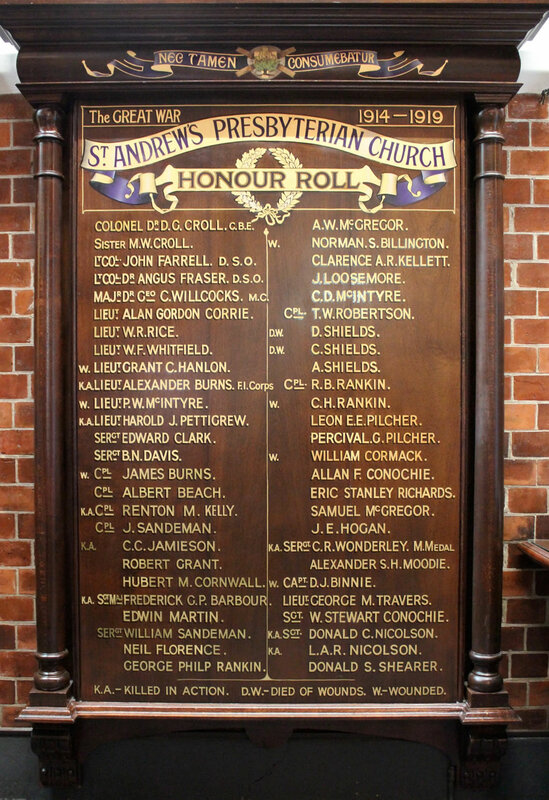 2 Robert Campbell Hamilton’s name is also on an honour board in the Merrington Anzac Memorial Chapel. The kind assistance of Mr Neill Florence (son of John Neill Florence) and Mrs Margaret Florence (widow of the late Rev Ian Florence) is acknowledged with sincere thanks.